In science, “translation” embodies the concept that data gathered in one situation is meaningful for data gathered in another. Applied biomedical research seeks to translate laboratory research into effective treatments or cures. It spans many levels of study. In oncology (the field of cancer biology), some individuals study how cancerous cells grown in a dish operate and grow and how best you can destroy them. Others study tumor growth in animal models; they do this because the behavior of cells in a dish does not always fully predict how cancer will grow in a living body. Because we want to understand how cancer occurs and progresses in humans, yet other scientists use epidemiological or imaging techniques to directly study cancer patients. Information gained at one level informs and fosters the understanding of information gathered at other levels. No single experiment or scientist answers everything – it’s the collective work of the larger group of researchers working at all levels that pushes things forwards. This is how translation is made possible. A hotly debated question in translational research is whether data gathered in animals 1) always, 2) often, 3) rarely or 4) never is meaningful for our understanding of human biology. Though most scientists and clinical practitioners feel strongly that it is often predictive, explicit examples are required to convince the broader public. Clear evidence of translational value is found in research on the biology of drug addictions – something that I study in my laboratory. A large number of both rats and humans find drugs of abuse (cocaine, heroin methamphetamine, nicotine, etc. ), when ingested, to be incredibly rewarding and will engage in significant drug-seeking behaviors to obtain it. In that sense, the study of these drugs’ effects on rats translates well (though not perfectly) to its effects on humans. Importantly, it translates “well enough” to make the rat a useful model organism in which to explore how drugs of abuse take control of some individuals by altering their brain chemistry. We have made excellent progress in this area over the last 15 years. Of all areas of biomedical research, the study of the brain poses the biggest challenge for translational research because it is this organ that differs most across species. There is no doubt that a mouse’s brain is dramatically different from that of a monkey which is still different from that of a human. But do those superficial differences matter? Not as much as you might think! Let’s go back to the earlier example of drug abuse. Addictive drugs are chemicals that, when ingested, make their way into the brain where they alter the activity of brain cells, consequently changing the function of circuits in the brain that mediate reward. This is why they make people experience euphoria, relaxation and a sense of well-being after they take them. Remarkably, despite obvious differences in the brain, rats also very much enjoy the effects of these drugs. When offered an opportunity, they will take them voluntarily (e.g., press a button to trigger an injection of the drug). Even more impressively, even fish find addictive drugs rewarding. So, actually, despite the superficial differences, there is a huge amount going on in the brain that is similar across model organisms. This is because the anatomical differences between rat and human brains are actually much smaller than what is shared between them: common sets of circuits with similar functions. This point is crucial. If fish and rats can be used to predict some of the responses of humans to addictive drugs, they can be used in translational research to explore the therapeutic effects of drugs used to treat brain disorders, such as addictions, as well. It is important, however, to distinguish between what an animal model can reveal and what it cannot. In the case of chemical addictions, animal models can help you to understand the physiological and basic behavioral processes that drugs act on to alter the body. Again, studying the effects of an addictive drug in rats can help us to understand how it alters the reward circuit and how that relates to drug seeking. Here, translation is excellent. At the same time, it does not fully recapitulate the psychosocial consequences of drug taking in people. Because the drug is available for free, rats do not have to steal to get money to buy it. Because they are not expected to show up to work on time and be productive, drug use does not cause them to get fired from their jobs. Because they do not get married, they are not at risk of divorce when their drug-taking behavior gets out of control. Because they do not share needles, they are not at risk of hepatitis C or HIV infection. So, from a biological perspective, study of addiction can be modeled well in rats, but the psychosocial consequences are not. 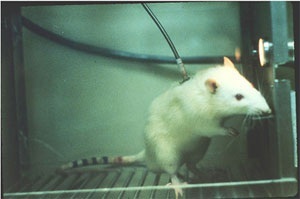 Rat researchers have revealed the neural mechanisms by which addictive drugs act in exquisite detail, and all modern, FDA-approved treatments for drug dependence arose from basic, mechanistic studies in animals (examples include Revia for the treatment of alcohol dependence and Chantix for smoking cessation). Clinical researchers then are able to tell us whether and how these treatments affect psychosocial functions in drug users. In that sense, like our colleagues who study cancer, we integrate study from many levels together to fully understand the biology and psychosocial consequences of drug abuse and its treatment. It is because research at many levels integrates so well that providers of clinical intervention often closely study and attend to studies conducted in animals. An international society called the College on the Problems of Drug Dependence brings together scientists, physicians and social workers who are particularly interested in solving problems relating to addiction. Here, each attendee carefully studies the results of the other researchers – with studies in humans designed based upon clinical observations, and clinical tests being spurred by rat studies. There is little doubt in the group – whether one consults patient-oriented researchers or people that examine cells growing in a dish – that studies of living animals are a critical part to the overall translational effort to stem the impact of addictions on affected individuals. Though animal research will not solve all of the mysteries of addiction, or of any complex human disease process, it is a foundational part of most areas of biomedical research and patients, patient advocacy groups and treatment providers overwhelmingly support it.